Washers are sold separately. 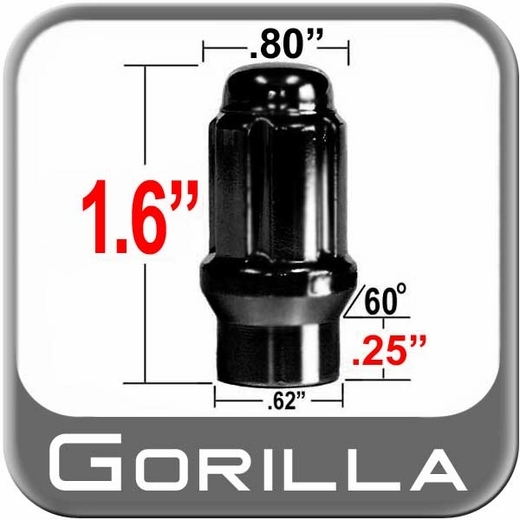 Click here to see our E/T Ultra lug nut washers to fit this lug nut. Bought these for my 4Runner and it fits perfectly. I had them before in chrome, but I bought them elsewhere. After I found this place, I will start buying them here. The price is great and I'm able to buy what I need in bulk. The shipping is fast as well, it only took a few days. I'm overall satisfied with the transaction and product. fit perfectly on my after market rims for my tacoma--extra thread to secure your wheel. top notch lugs and they complimented my black rims. I needed a replacement lug nuts, appreciate being able to order the exact quantity I needed. Quick shipping. I posted the Brandsport URL to my favorite vehicle forum to make forum members aware of the great customer service provided by Brandsport. Just what you need Tacoma guys. The shorter front studs just didn't feel right at all, screwing on a lug nut. These extended thread lugs are just the ticket. Feel way safer now. And here's a great place to buy them. Shipping was super fast too.